Abstract: Yttrium Aluminum Garnet (YAG, Y3Al5O12) crystals doped with Erbium have posed an interesting position in the field of rare earth solid state lasers as they possess the property of self-saturation, in which the upper energy level in a laser has a much shorter lifetime than that of the lower level. This is the case in the 2.94μm transition present in the material. That at first seems to make this material unfit for use as a laser gain medium, however further research into these classes of rare earth materials revealed interesting physical properties that allow it to be a niche mid wave infra-red (MWIR) coherent source in the continuous wave (CW) and pulsed regimes. This came to fruition due to decades of modeling and spectroscopic research investigating the non-linear energy transfer mechanisms of excited state absorption (ESA), energy transfer up-conversion (ETU), and cross relaxation (XR). These effects show up in the rise and fall times of the levels observed through fluorescence. Resulting in the characteristics of the rise and fall no longer representing that of a simple single exponential. As the population increases the non-linear effects begin to appear as noted by a changing slope of the rise and fall when plotted on a semi-log scale. The population evolution for each of the lasing levels is now affected by ions recycling energy and in turn cause the lifetimes of the levels to “effectively” change to a point where simple linear models do not adequately describe the system and its performance. The non-linear energy transfer dynamics of Er:YAG are modeled under high resonant pump conditions. Specifically the multi-photon effect known as excited state absorption (ESA) is modeled by measuring the cross section in single crystal Er:YAG samples utilizing a pump and probe technique. The measured ESA cross section is then included in the rate equation modeling that has typically been ignored such an effect when modeling the non-linear ion to ion interactions. By pumping with selective resonant pumps, the interaction dynamics of the 4I11/2 and the 4I13/2 levels in the Erbium ion reveal the contributions of the non-linear energy transfer mechanisms towards the populations of the levels respectively. This thesis work shows the added accuracy of the rate equation modeling by its inclusion of the measured ESA cross-section and its effect on the population evolution in the Er:YAG system. The model will be tested with measurements made with select Er:YAG crystals being pumped by combinations of the 962nm, 808nm, and 2.94μm lasers with a chopper spinning at a rate on the order of magnitude of the lower lasing level lifetime. 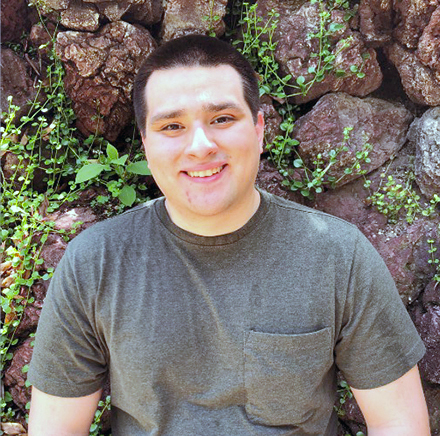 Biography: Christian Vega is a Ph.D. candidate in Electrical Engineering studying under Professor Oscar Stafsudd. Christian received his B.S. in Electrical Engineering with a minor in Mathematics from the University of Nevada, Las Vegas in the spring of 2013 and his M.S. in Electrical Engineering from UCLA in 2015. Christian has also been working at Northrop Grumman Aerospace since 2015 as an intern working on various projects ranging from internal research and development to government contracts.